Thailand is an enchanting country featuring Buddhist temples, exotic fauna and flora, Thai elephants and many beautiful islands and beaches. It has a fascinating history with unique Buddhist culture. Thai food and restaurants are now renowned throughout the world. The people are friendly and welcoming and epitomize Thailand as the ‘land of smiles’. 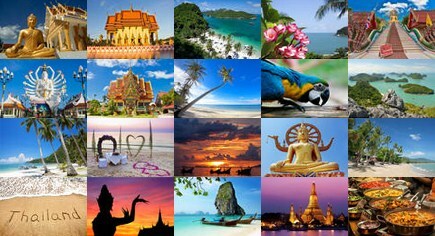 Thailand offers a great variety of attractions. These include diving sites, sandy beaches, hundreds of tropical islands, varied night-life, archaeological sites, museums, hill tribes, exceptional flora and bird life, palaces, a huge amount of Buddhist temples and several World Heritage sites. During your stay you can follow courses popular classes in Thai cooking, Buddhism and even traditional Thai massage.Thailand holiday homes and Villas offer visitors the perfect base to explore all that Thailand in a self catering holiday rental accommodation in most sought after areas.Anyone going to Thailand is likely to first visit Bangkok with its many historical, natural and cultural sights. However it is well worth making the effort to also visit the southern beaches and islands and the north of Thailand which is the main region for trekking and adventure travel with its diverse ethnic minority groups and forested mountains.Bangkok is a tropical metropolis that is also one of the most traveller friendly cities in Asia. It is renowned for its main shopping malls, offering an astounding variety of international and local brands. “Chatuchak Weekend Market” is possibly the largest market in the world, selling everything from household items to live animals. The “Pratunam Market” specializes in fabrics and clothing. The night markets sell items such as T-shirts, handicrafts, counterfeit watches and sunglasses. In the vicinity of Bangkok one can find several visually stunning floating markets. There are exotic orchids and delicious fruit everywhere with bougainvillea and frangipani blooming all over the city. The justifiably famous Thai cuisine is varied and affordable.Most of Bangkok’s sights are concentrated in the “Old City”. There are hundreds of temples, the Grand Palace, Wat Pho and Wat Arun being the best known. The Wat Phra Kaew houses the Emerald Buddha, the most sacred Buddha image of Thailand.Ayutthaya is 76 kilometres north of Bangkok and boasts numerous magnificent ruins of temples and palaces. Its proximity to Bangkok make it a popular day-trip destination. Ayutthaya was one of Southeast Asia’s (and probably the world’s) most prosperous cities in the 17th Century and beyond. It is now a UNESCO World Heritage Site. Kanchanaburi is of interest as the sight of the bridge over the River Kwai, the start of the infamous World War II ‘death railway’ to Burma. Pattaya is a seaside resort on the eastern coast of Thailand, about 150 km southeast of Bangkok. It is mostly known for its go-go bars, but efforts have been made to provide more family-friendly attractions and activities. Phuket is Thailand’s largest island 862 kilometres south of Bangkok. It is in the on the west facing the Andaman Sea. At one time the island was on one of the major trading routes between India and China. In recent times, tourism has transformed the island into Thailand’s wealthiest province. Swimming, snorkeling, diving, yachting, jet-skiing and para-sailing are the most popular activities on the island. Other activities include free-diving, windsurfing, kite surfing, wake boarding and deep sea fishing. Koh Samui is an island of great natural beauty and variety. The palm fringed shoreline and coconut and fruit cultivation of the coastal lowlands rise to a central granite massive, the slopes of which are cloaked in virgin rain forest. Chiang Mai, the northern capital of Thailand, is located more than 700km northwest of Bangkok. Surrounded by mountains with legendary, mystical attributes, it is a quaint, moated and walled city with more than 300 temples making the old city centre visually striking. As well as being culturally rich and diverse, Chiang Mai has fantastic handicraft shopping, delicious food and proximity to many natural treasures.